Sometimes you stumble across a portfolio where the artist only has a couple of comic based pieces, other times there can be just one work so brilliant, you'd risk being stoned to death by fellow art lovers for putting something else beside it. 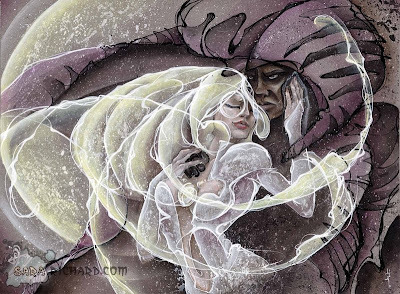 These are Random Works of Wow and illustrating the point this week is Sara Richard with Cloak and Dagger. There's something just on the lighter side of Simone Bianchi about the way Sara works, but the mesh of media she draws in perfectly captures Marvel's street kid lovers. If you click to enlarge to see it full size, you'll get an even better idea about what I mean. What do you think? Sound off below, click to enlarge or view more Random Works of Wow here. To see more of Sara's style, click here. Beautiful, beautiful art. Love the way they just melt/blend into each other. That's a great representation of their whole relationship really. Thanks Dale - I reckon so too. It's like you can't tell where one ends and the other begins. I agree, I've never seen white melt into black like that. Beautiful concept and excellent execution. Thanks Random! Cloak and Dagger are the flagship 80's characters for me. Back when accountants didn't rule who got a series and who didn't.